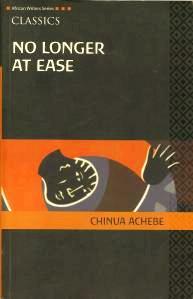 This second part of the trilogy is focused on Obi, Okonkwo's grandson. Nwoye, his father, gave up the way of his people, abandoned heathendom and converted himself and his entire household to Christianity. Obi grew up devoted to academia in so far as his village union awarded him a scholarship, granted that it must be paid back. He was sent to study law in England on the benefit of the union group, albeit, a self-willed Obi ended up reading English. On his return, as was expected, he secured a European post as a Civil Servant in an emasculated Nigeria, in the threshold of independence. Henceforth, the novel subtly evolves into a voracious read. Obi found himself in the throes of making ends meet and a cultural lag. To start with, he earned outstandingly more than his compatriots, nevertheless, his salary was nothing to boast about after sending money home for his parents' welfare and brother's education, also after refunding his village union on account of his scholarship and of course, not to forget his personal expense such as car insurance, light bill, social life and so on and so forth. In fact, he hardly pulled through. Moreover, he found it abstruse, preposterous and scandalous that he should be barred from marrying the love of his life; merely because one of her forefathers had been dedicated to serving a god, thus, setting himself apart and turning his descendant into a social pariah forever. How did Obi solve his financial difficulty? If he solved it at all. Running up an overdraft? Or resorting to accepting bribes? As a matter of fact, the latter is an utmost corrupt practice the colonial government considers to be through and through in the African. Did the social stigma behind his betrothed deter him from marrying her? Unquestionably, you have to read the novel to find out. Finally, this is a book I took much pleasure in reading. "No Longer At Ease" is a felicitous title for this novel; meaning "not free anymore from worry and awkwardness". But perhaps, "The Fall of An African Man" would not have been a bad title. Anyway, I am just thinking out loud and putting it into writings. The following quotes I found very funny, and yet loaded with significance. Many of his hearers whistled in unbelief when he told them that a man could not go to his neighbour's wedding unless he was given one of these papers on which they wrote R.S.V.P - Rice and Stew Very Plenty - which was invariably an overstatement. "Na him make I no de want carry you book people," he complained. "Too too know na him de worry una, Why you put your nose for matter way no concern you? Now that policeman go charge me like ten shillings." Give the following quote your own meaning. Obi said he wouldn't be worried if local leave was abolished. But that was for the Government to decide. "It's people like you who ought to make the government decide. That is what I have always said. There is no single Nigerian who is prepared to forgo a little privilege in the interests of his country. From your ministers down to your most junior clerk. And you tell me you want to govern yourselves." I utterly recommend this book to everyone. It is a must read. it looks like this your favourite book of the trilogy...me too!! !I really like your post though !! awesome,really!! Tell what do you think? thanks for stopping by. And.. Keep up with your new blog. I will defnitely stop by.